"That was the worst call, bro… What the muck were you thinking? You bluffed that one like a true donk. Have you never heard of a poker odds calculator, buddy?" If you've played even one online poker tournament or ring game, chances are your poker hands have been studied and ridiculed by other self-proclaimed poker pros seated at the same table as you. It's time to put a stop to it - for good. Just use our online poker calculator. It's free. It's accurate. And it can improve your game tenfold. Why do you need a calculator? What are the benefits of our calculator? If you're not using a poker calculator online, beware. Many will berate you, telling you that you have no idea what you're doing just to weaken your spirits and take your money on the next few poker hands. If you're a newbie, you'll keep second-guessing yourself and mucking otherwise amazing hands. That's just the nature of the game - both online and off. With our poker odds calculator, you don't need to be a super genius or a math whiz to figure out how to play poker hands. We do the legwork for you. But believe it or not, a few of the poker players throwing comments your way actually know what they're talking about. They're not psychic. They're just human poker probability calculators - people able to tell you what the chances of winning a hand are in a matter of seconds. Hit a pretty bad beat? It might not have been as bad as you think. In fact, you might have been destined to lose that poker hand based on poker calculator online odds. The poker hand calculator is the perfect tool for helping you improve your online poker game. While it can't tell you how to play specific hands while you play online poker, it's the smartest way to analyze past poker hands and take your game to the next level. Just plug in your cards, the other hold cards, and the community cards. Then, let our poker probability calculator crunch the numbers. You'll find out what the chances of winning, losing, and tying are. To take advantage of our poker sites calculator, just use the hand history tool at your favorite online poker site. 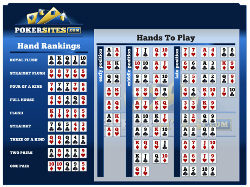 Most of the good poker sites have a hand history tool that shows you exactly how your most recent hands played out. You'll be able to see your cards, the cards that beat you, the community cards, and other important information needed for the poker hand calculator to generate poker odds statistics. the move you made was the right call. And with all the cards displayed before you, you'll be able to figure out why the odds weren't in your favor and what went wrong. When you combine all these known factors, your chances of winning all of the sudden becomes a lot less unknown. Our poker odds calculator takes everything that's known and everything that isn't, and then figures out what your chances are to take the poker hand down. The online poker calculator above is designed to simulate real-money or play-money poker hands at popular online poker sites. Obviously, the design of the table varies from site to site, but the basics are the same. You've got a table with community cards and various players seated around the table with hole cards. 1) Choose your game. You can pick from Texas Hold'em, Omaha, Omaha High/Low, Seven Card Stud, Seven Card Stud High/Low, Seven Card Stud High/Low No Qualifier, and Razz. 2) Choose your cards from the face-up deck at the bottom right of the online poker calculator. As you click a card, one of the hands in the deck will populate. 3) After the first hand in the poker probability calculator has been set, the next card clicked will populate the second hand that's marked as dealt in. 4) To deal in another hand, click Deal In. The empty squares will be replaced with facedown cards. Continue to click cards from the bottom right of the poker hand calculator to create the new hand. 5) If no more hands are dealt in, the next card clicked will populate the community cards in the center of the table. 6) After all community cards are populated, click Calculate Odds to discover the odds of winning. Click to Expand + Want to play like a pro? 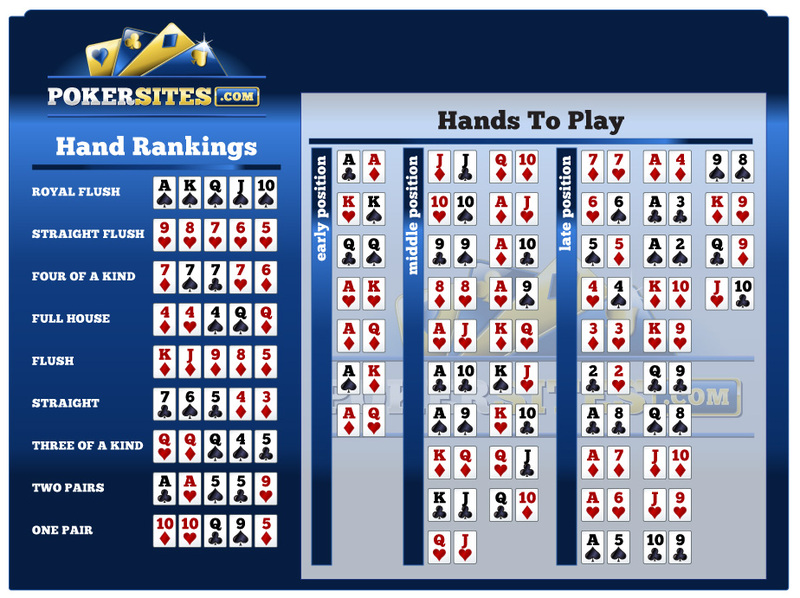 Download and print out our handy poker odds chart to always know the best starting hands and pot odds. Pin it alongside your monitor to help you learn as you play and, before you know it, poker odds will become second nature‏. And once you have become a master of the tables, why not build upon that and sign up to more sites. Poker is a game of capitalizing on small edges, and knowing these odds will give you a big one over beginning players.